Or of course, you could decide on a combination of all four. Velux Roof Terrace: a top-hung upper element and side-hung lower element combine to produce a doorway to the outside terrace. We can convert all types of loft/attic: old traditional properties, new timber framed properties and new truss roof properties. We have an excellent track record in securing planning permission for conversions through our extensive knowledge and experience of the national, regional and local planning policies and development plans. Remember, you always need stairs for your new loft conversion and there are many types to choose from. Stairs are a specialised product that can not be bought off the shelf, that is why all of our staircases are bespoke and custom made to the highest standard. 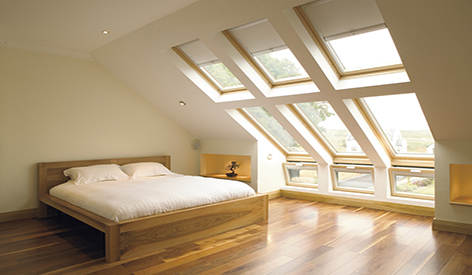 Let us take care of all your attic conversion needs. Go ahead, upgrade your attic, it's not just for storage. So to answer your original question, How much does a loft conversion cost? That really all depends on you! So get in touch now for a consultation with one of our dedicated experts or to arrange your free no obligation estimate.